Utility player Henrik Pedersen has left Hull City with immediate effect to return to Denmark. After helping the Tigers to promotion to the top flight for the first time in their history, Pedersen is going back to his homeland for family reasons. 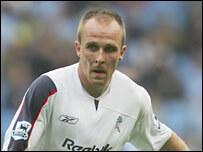 But the 33-year-old ex-Bolton man will not retire from the game as he is joining home-town team Silkeborg IF. City boss Phil Brown told BBC Radio Humberside: "It's a disappointing one. It's a shock to everybody." But the former Denmark international will part company on good terms after a memorable 11 months with the Tigers. "It's a decision I respect as it's for family reasons," added Brown, who also had Pedersen under his command in his days as number two to Sam Allardyce at Bolton. "He has commitments back in Denmark. "There was a year's contract on the table and Henrik's asked permission to come out of that. "He wants to continue playing football. But he's promised he will only play for his home town team back in Denmark, Silkeborg. And we wish him all the best of course we do." Meanwhile, City's new signing, Brazilian international Geovanni, has joined his new team mates at the club's Italian training camp in the foothills of the Alps after agreeing a two-year contract with the Premier League newcomers. And the Hull boss expects him to be a big hit at the KC Stadium. "He is a quality international player," said Brown. "He hails from one the greatest international nations that have ever played football. "Brazilians have a love for the ball. They want the ball at their feet, treating it with care and making sure they don't give it away." And the Tigers boss says that, after a year of frustration across the Pennines at Eastlands, the 28-year-old former Barcelona star will be keen to prove his top flight credentials. "He had a disappointing season at Man City last year," said Brown. "And, consequently, we jumped at the chance to sign him a on a free transfer. "He fitted in to the group like he hadn't been at Man City last season, but like he'd been at Hull City and we're very pleased to have him onside."